Stepping away from the whiteboard in science education. Are We Investing Enough into the Next Generation of Science Educators? How often do we give teachers the opportunity to reflect not on the success of the lesson they taught, but rather the design of their curriculum in accordance with their subject matter structure? Subject matter structure can be defined as the foundation in which a teacher scaffolds the content that he or she teaches. As a biology teacher, I scaffold my personal understanding of biology from a micro to macro prospective. 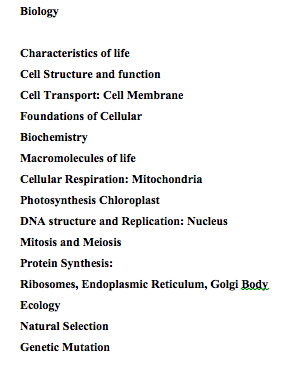 I, thus, prefer to teach (and to an extent, I better understand the field as a whole) when I start with cells, their structure and biochemistry, and then teach each subsequent unit as a focus on individual organelles and their functions. I end my course with ecology and “macro” biology in order to relate the “micro” concepts to how life interacts and functions on our planet. When writing and creating curriculum, we often look at our personal structure of the course and design presentations, labs, activities, assignments, etc. to reinforce and convey content knowledge. Traditionally, the design of such curriculum models mimics that of the curriculum taught to the educator himself. The problem with this practice, however, is that educators are somewhat reluctant to changes to their initial structure for understanding (Gess-Newsome, 1992). This reluctance is an artifact of their learn structure and scaffolding. So, how then, can we set aside time for teachers to reflect on their subject matter structure and how it is conveyed in the classroom? Preservice teachers will more than likely take subject matter methods courses which are intended to provide instructional methods, research on how those methods should be implemented and what currently constitutes best practices for teaching content. In the sciences, most methods courses require learning the 5-E instructional model, understanding the differences between inquiry and activity-mania and discovery approaches when teaching content. What seems to be lacking from these methods programs, however, is the understanding of how subject matter knowledge gained by the preservice teacher is structured on a personal level and how that structure affects the learning of their students. Current research shows that science education is in need of an overhaul. Common methods of classroom instruction convey basic understanding and a narrow view of science learning coupled with activities devoid of problem solving and only loosely related to conceptual learning goals (O’Sullivan and Weiss, 1999, ). Novice teachers, developing their practice of science teaching and classroom management, are not given adequate time to reflect on the meta-cognitive processes used to create lessons taught. Society advocates for and looks to transform science education practices into “more synthetic treatment of important concepts and of how these concepts can shape our understanding of ourselves and our planet” (NRC, 1990). As these transformations occur in instructional practices, the goal of teacher preparation should also include a reflection on how individual subject matter structure affects the ability for one to provide more inquiry-based and problem-solving practices into curriculum designs. Evidence of “practice reflection” shows that by providing young educators with limited classroom preparations and time to evaluate their individual subject matter structure in relation to the desired outcome of the students has greater influence on expertise in teaching than experience alone (Gess-Newsome, 1992). In order to improve science education as designed by the level of critical thinking demonstrated in the Next Generation Science Standards, science teachers need opportunities to reflect on their knowledge and structure of their relative fields and how to translate that understanding best to their students. If we want true change in education, then we need to be willing to invest more into teacher preparation, course loads and preparation support. I'm a high school chemistry and biomedicine teacher with a passion for teaching beyond the norm and breaking the plane. I have an M.Ed in Science Education and my classroom goals are to inspire, motivate and nurture self-directed individuals to their fullest potential. I'm the mother of two adorable Valentines and an Easter bunny, and the wife to my best friend. Join me in breaking the plane in everyday education.